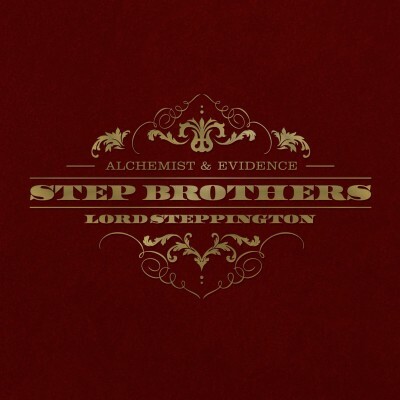 Lord Steppington is the collaborative debut studio album by California-based hip hop duo Step Brothers (rapper/producers The Alchemist and Evidence). Evidence has traveled the world, released a string of acclaimed albums with Dilated Peoples and as a solo artist, has become a respected producer crafting beats for Kanye West, Beastie Boys and Linkin Park among others. For his part, Alchemist has become one of rap’s triple threats, producing for Snoop Dogg, Eminem, Nas and many more. Alchemist is also an accomplished rapper and Eminem’s touring DJ. While they were building their respective careers, Evidence and Alchemist had worked together regularly collaborating on Dilated Peoples albums, Evidence’s solo material and Alchemist’s releases. As the pair continued collaborating, they began labeling themselves as Step Brothers when they would record, as noted on Evidence’s The Layover EP. The pair then decided it was time to record an album together. 4 comments "Step Brothers – Lord Steppington (CD) (2014) (FLAC + 320 kbps)"
Good start to #2014 , hope more albumz like this drop soon , can’t wait 4 new Mobb Deep album too YO! Pls reup. Uploaded page is not found. Plz re-up! Links are dead.